ABC Concrete Cutting utilizes Prosoco/Consolideck products, as they are the best options in concrete dyes, sealers, and cleaners. The videos below demonstrate some of the steps required for a dye and polish. 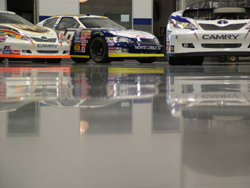 Polished concrete can sometimes be mistaken for marble; it is so smooth and attractive. No other floor system can boast such beauty as a Polished Concrete floor system. Epoxies don't even come close. Photos may help tell the story, but a real-life demo will make you a believer.